Druzhba is one of those restaurants that Zagat gives a 25 for food and a 15 for décor and service. 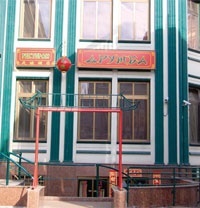 Druzhba is said to be the best Chinese restaurant in Moscow, and it may be but only because there aren’t any others, practically. What’s great about Druzba is that it is very much like your favorite local Chinese back home, and, if you believe the management, Druzhba actually has Chinese cooks (though the management refused to introduce us). Don’t get me wrong from the comments in the following review; I enjoyed Druzba and I could hardly set my chopsticks down to take notes. Druzba is authentic and cheap (by Moscow standards), qualities sorely missing from the city’s restaurant scene. Druzhba (friendship in Russian) has been around forever, located directly above the Novoslobodskaya metro station with a McDonald’s to the left and a Starbuck’s around the corner. It’s tucked in on the right of the small Druzba torgovy dom (trade center) that fronts on Novoslobodskaya Ulitsa, and it’s down half a flight of stairs, which means, by the way, that you can forget your mobile phone. The staff are very friendly, and it is usually busy. I tried Druzhba twice, once with Passport publisher, John Ortega, who loves the place, and then for lunch with Passport editor, John Harrison. With JO, we took one of the dozen or so private rooms at the back at a cost of 600 roubles per hour complete with video and music system. With JH, we selected non-smoking, but when we were ushered to one of the private rooms in the back, a small room with six tables, we retreated to “smoking” in the main dining area. The non-smoking room reminded me of one of those smoking enclosures that airports provide for the few smokers that remain in the world, mostly in under-developed countries. 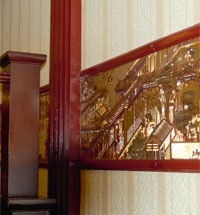 The menu is in Chinese and Russian, but is illustrated with photos of each dish, tagged with a number to the description. 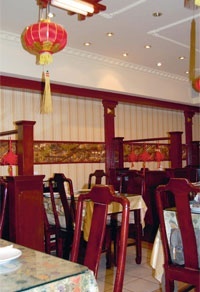 As might be expected of a Chinese restaurant, the menu is heavy on pork and chicken, and the fish section is dominated by carp. As a lapsed vegetarian, I like to find good vegetarian dishes, but Druzhba has very few, and even the heavenly Tofu Homestyle has ample white meat mixed in. With JO, we tried large sample of the menu, served out on a large rotating glass tray: Fried King Shrimp (1800r), Sweet and Sour Chicken (500r), Fried Pork with Sweet and Sour Sauce (450r), Tofu Homestyle (350r), Peking Duck (1500r), Wild Cabbage with Mushrooms (500r), and Fried Blini with Vegetables (the Druzba version of spring rolls – 400r). There were no losers from our selection and the portions are ample. I don’t know whether it was nostalgia for Chin’s back home, or surprise that such food was available in Moscow, but I enjoyed. The Sweet and Sour Chicken and the Tofu Homestyle really got my attention. The chicken was prepared crispy, softened by the heavy sweet and sour sauce and garnished with pine nuts. The Tofu Homestyle was the first good tofu I’ve tried in Moscow, served thinly sliced and layered with Chinese black mushrooms, bamboo (and the white meat) in a slightly spicy sauce. I like tofu, the high protein soy curd coagulated from soymilk. The tofu I find in Moscow supermarkets is either a very expensive import, or a home variety that appears to be made with animal feed grade soybeans. Tofu should be made from special food grade soybean varieties. Druzhba has the real thing. The Wild Cabbage, slender, soft, steamed and served with a light sauce, was also tasty and a first, and it left me wondering where they found this vegetable in Moscow. Druzhba, surprisingly, came up short on the rice with just two choices: a bowl of steamed rice (100r), and their version of fried rice with vegetables, which was far away from the fried rice I’m used to and not worth ordering. Sauvignon Blanc runs about 400 rubles at a Moscow supermarket, so the Druzhba markup is four times retail and five+ wholesale, a typical Moscow restaurant markup. A Chinese Tsingtao beer runs 200 rubles. On both visits, Druzhba was crowded. Druzba doesn’t accept credit cards and parking is difficult. But the food is great, and I’ll be back.